At The Rim: HoH phone relay system cuts. But, they INCREASED funding for sign language users, and in the UK offered them $1400 a week. Federal funding cut is a threat to hearing impaired phone transcriptions, providers say. Shirley Edwards has a phone transcription service for the hearing impaired and said she would be lost without her phone transcription service. Shirley Edwards was thrown into a world of confusion and frustration when she began losing her hearing in her 30s. Key points: The Federal Government wants to cut NRS funding by more than $10 million a year Senate estimates has heard the new tender process failed to deliver value for money Deaf Services Queensland said one in six Australians were affected by hearing loss The Brisbane woman, who has two cochlear implants, is able to handle phone calls on her own thanks to a service that converts conversations into text for people with hearing difficulties. But there are growing questions over the future of the National Relay Service (NRS), which provides the translations, with the Federal Government planning to cap funding for the service at two-thirds of its current cost. 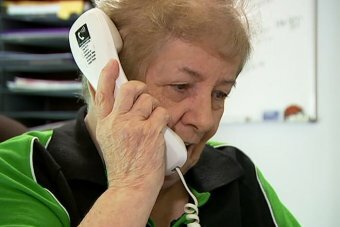 Mrs Edwards is among more than 4,000 people around Australia, largely hearing-impaired or elderly, who rely on CapTel handsets to communicate on the phone. The handset operates like a regular phone, except it connects to an NRS operator who translates the conversation and sends it back as text within seconds. "It takes away the isolation and gives me a lot of independence," she said. "I don't have to rely on people to make my phone calls for me." A range of phones for deaf people PHOTO: A range of CapTel phones for people with hearing difficulties. (www.nocostcaptel.com) A Senate estimates hearing in February was told it cost more than $31 million to provide the NRS in the 2017/18 financial year and $32 million in 2016/17. With the contract now up for renewal, the Federal Government has called for tenders capped at $22 million a year.